Gabhart, Ann H. The Innocent. Grand Rapids, MI: Revell Publishing. 2015. Hard to believe but I have not read any books by author Ann Gabhart yet (not sure how that happened). Though this novel is not a series, it does take place in a familiar community from previous books but I had no problem following through as a stand-alone. (If I missed anything, I did not even realize it.) I enjoyed the mystery, light romance, humor and faith included in this story, making this author now one I will watch for in the future. Definitely well-written with an interesting storyline! 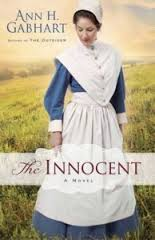 This entry was posted in Christian Books and tagged Adventure, Ann Gabhart, Christian, Christian Author, Christian Book Review, Christian Fiction, Christian Historical, Christian Romance, Harmony Hill, Shaker, The innocent by Savurbks. Bookmark the permalink.